Ores, Minerals, and the Mining Industry compose the backbone of the EvE economy. That is one of the primary draws of the game for a large subset of the player base; as just about everything in terms of modules and ships have existed at some point as minerals tucked away inside of the silent asteroids that float in space. Those rare times when a capsuleer takes a moment for quiet reflection in the silent expanses of space are prime opportunities to reflect on the enormity of the entire process. From asteroids to minerals to ships for Tech I items; and asteroids to minerals to ships, with moons to goo to intermediate composites to advanced composites to components, all together to Tech II ships and items. It is quite an extensive process. Available in sufficient quantities relative to consumption demand. Thus there is not 900% availability of one raw material relative to the rest. Raw materials should of course not be plentiful to the point of wasteful surplus. That is something that gets balanced early on in game development, that way your players have to spend a representative amount of time working through whichever part of the process that interests them. It all comes down to amount of time playing and subsequent subscription duration for monthly fee-based games. The above chart shows the amounts of minerals that are available from refining all the ores. It was created by making a table of all of the Ores in EvE, with their individual refine values per mineral, and summing each column for the respective mineral (Tritanium column, Pyerite column, etc). This chart looks a little wonky doesn't it? There appears to be a huge plateau once you start mining rocks that give Isogen and rarer! The first question that springs to mind is: "Is this greater mineral availability reflected in the mineral demands of the items that players build?" Let us check and see. Well, this is interesting..... 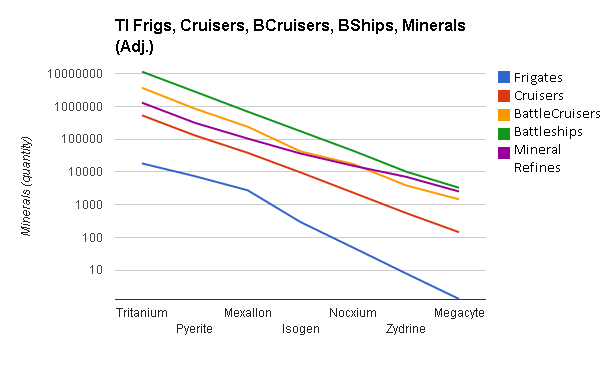 There is no sharp knee in the graphed data for ship mineral requirements. 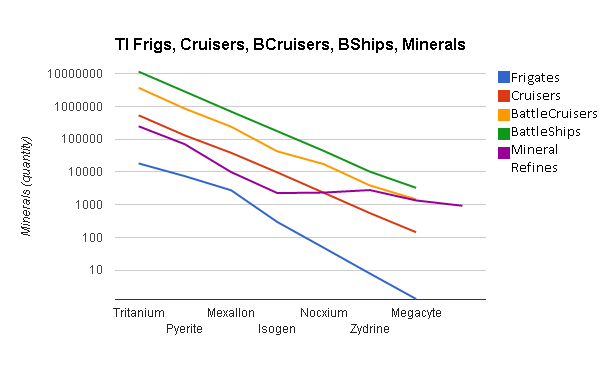 This graph was created by plotting the average mineral requirement per mineral by ship class. 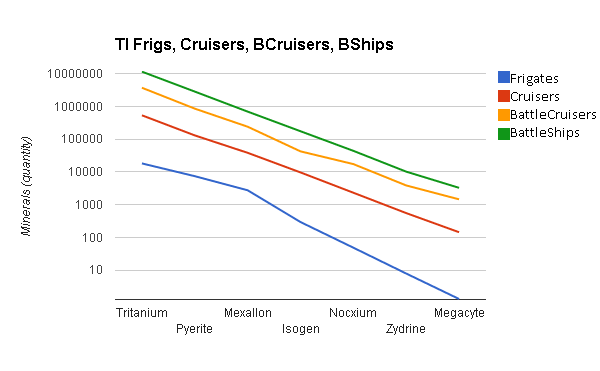 E.X: average of all cruiser Tritanium requirements, all battleship Isogen requirements, etc. The astute reader will notice that the Y-Axis scales are different between the two graphs, so let me take one moment and present the data together on a single graph. Well, would you look at that. It seems that there should be a huge glut of the high-end ores out on the market! Is this a result of the recent Crius patch where all the refine and reprocess values were monkey'd with by CCP? Before we can go down that road, let us make sure that there isn't some large market-group that is consuming all these high-end minerals. Nope, Does not look like it. Though I find it extremely interesting that the capital parts and cruisers essentially lineup! 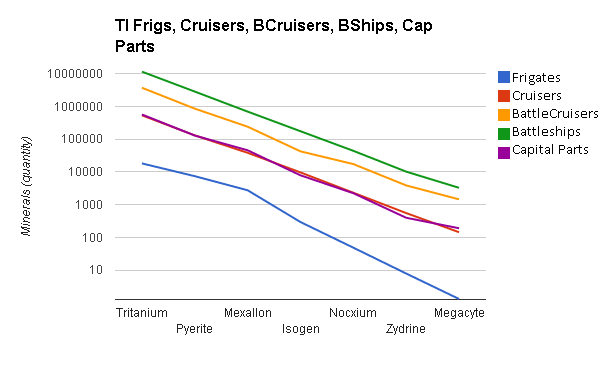 Nope, A quick glance at ammunition BPOs shows that just about every type and flavor only requires Isogen and lower with only a few like cruise missiles needing 2 or 4 Zydrine. I know that Drug Manufacture consumes Megacyte but I am confident that that market is not THAT large. Wait a moment...... What about the actual process of acquiring the raw ores? What if CCP balanced against the amounts that are feasible/possible for a player to mine? So, for the purpose of argument lets work with this fairly decent alt pilot that I have, called David. David is pretty much your run-of-the-mill mining hulk-alt; ~10 mil SP, with 3.5 mil in resource processing, 2 mil in spaceship command, 2 mil in Neural enhancement and shields, and the rest in various other categories. He uses a Hulk with Tech II strip miners and Tech II crystals for HS ores and Tech I crystals for NS ores. Unbonused, just sitting in station, each strip miner pulls in ~1050 m3 of ore per cycle. Adding all that information to my spreadsheet, and calculating the VOLUME of ore that he can mine per cycle for three strip miners results in the graph below. Now this is really interesting! That purple line there represents the quantity of minerals, analogous to the first chart in this post, but adjusted for mining volumes for an average player. So not only is the mineral availability in EvE balanced to provide the necessary minerals for all production, it is also balanced with respect to player skills. The only real stat that gets changed as the player gets more skills (and of course the capability to use the higher meta-level items) is the volume of ore that is mined each cycle. This increase in mined ore will preferentially bonus the larger-volume ores like Isogen, Nocxium, and greater. The slight deviation in the slope of the adjusted mineral line most likely covers all the extraneous high-end mineral requirements from such items as boosters, various ships, and various ammo types. Originally I started writing this post as a means to say: "Hey! You guys broke something with minerals in the Crius patch!" Yet, as I delved deeper into the problem I eventually found the solution. So this isn't the "WTF CCP?" post that I intended. Since I had already expended all this effort to do the work I figured I would post it as a: "Nicely done CCP" golf-clap sort of thing. Plus it is an interesting topic to industrialists like myself and perhaps someone else out there would enjoy reading it. My comment leaves me in much the same position your post left you. Things are a little different, nothing appears broken, Eve carries on. I too must admit I’m greatly disappointed we don’t get to rage at CCP. I absolutely adore the new Industry UI. I spent no time preparing for the new UI, rather when it finally dropped I just started poking at it and quickly discovered it damn near does everything I want without requiring any special coaching. There is one little thing that would be absolutely wonderful. When you click on the Facilities tab and hover over one of the manufacturing/research/etc. icons a little system cost index pops up but it lacks precise numbers (the very thing efficiency hunters are looking for). I’m aware those precise numbers are available via the map interface but that means leaving the delightful industry UI and turns me into a grumpy panda. Any chance that system cost index bar could be replaced with actual numbers? Especially since the exact same information is already displayed on the icon you’re hovering over. I'm not entirely sure what the point of this post is. Not all ores are seeded with equal availability, supply and demand sorts out the pricing and optimal ore to mine whichever region. I will agree that the point of my post is largely esoteric. My main purpose in writing is was: 1) Document my findings 2) Just from a raw-numbers standpoint I found it quite interesting and slightly unexpected. Yes, once you think about it it makes logical sense that CCP would balance like that, but it isn't a topic that specifically comes up in my general discussions with game-designers (non-CCP, small-time freelance friends). As you rightly pointed out not all ores are seeded with equal availability. I find that this is a good thing because it draws people to certain areas of the game to mine specific asteroids; which is beneficial from a game-map leveling POV. With this in mind, let us tie this back into the focus of this blog: Low-Security Space. Your comment concerning the markets, pricing, and optimal ore was a very good one and got my gears churning again this morning. (before my coffee even!) A quick glance at Eve-Uni's website shows us the locations of specific rocks in relation to each area of the universe. 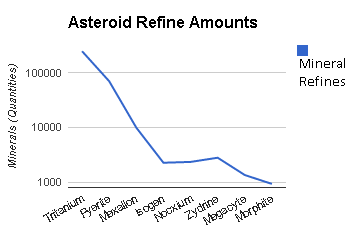 (http://wiki.eveuniversity.org/Asteroids_and_Ore) When you go back and re-work some of the data to show the value of the minerals in terms of ISK (http://i.imgur.com/mlDqCYU.png) I find it VERY interesting that there is a non-insignificant spike in the Nocxium ISK evaluation. Combining these two factors leads me to believe that there is not nearly enough mining activity going on in Low-Sec. Well... "DUH" you might say; but to me "Common knowledge" is kinda pointless without hard data to support it. Low-Sec is where the minerals Hemorphite, Hedbergite, and Jaspet are kings. They also happen to be the rocks with the highest concentrations of the mineral Nocxium per unit volume mined. Yes they are available in null-sec, yes Crokite also has more per refine (but not normalized to volume), but null also has even more valuable minerals (the ABCs) so null-miners will only go after the these "Low-Sec" ores if they are cycling a Cosmic Anom. I'll ditto Xaeroflex here. We have a real market in EVE. As such, there is no reason that the supply of any given thing needs to accord to any particular person's idea of what its demand is. Rather, the market will always equilibriate overall supply and demand via price. That's what markets do. And indeed, to the extent that your graphs show much it is that you have tested whether EVE's markets for minerals are rational... and found that they are. Put another way: miners pay attention to what they can earn by mining which minerals, and they mine the minerals that pay best. You’re both absolutely correct but I think you miss Kean’s primary observation, “So not only is the mineral availability in EvE balanced to provide the necessary minerals for all production, it is also balanced with respect to *player skills*” (emphasis mine). Kean, it seems, wasn’t expecting to find that 2nd avenue to tweaking balance. Given the overwhelming abundance of ore in Eve the balancing CCP undertakes ends up being purely game play related since the market will, indeed, adjust around glut and scarcity. In a sense, CCP comfortably fiddles about in Eve’s market all the time at both the supply end (mineral availability) and the demand end (ship balancing). In this particular case, the net result ends up being that CCP sets the parameters around how appealing mining particular ores will be as well as who will be mining it (noobs or vets). To be honest this isn't a terribly penetrating observation but I have run across players who genuinely believe we're involved in some sort of scientific economy simulator with robust real world application which leaves me absolutely baffled - no, it’s a game, and CCP treats it as such. "There is no reason that the supply of any given thing needs to accord to any particular person's idea of what its demand is"
Yes, Exactly! I am just glad that the data proves this out. That the only balance consideration is against what can be made! You might be surprised as the number of games that I have played where this is NOT the case. Sadly it is too many. Here, to me, is proof positive supporting one of its main selling points: The Sandbox / Player-Run Economy. It isn't like we are tripping over games left and right that pull this off. One thing is also made evident that you all seem to missing. What this graph demonstrates why megacyte has the same market value as mexallon and nocxium. Self evident then the increased risk of mining in null is not equal to the reward. Should this be intended by CCP then maybe the risk vs reward is only a player convention after all and certainly that does not apply to mining. "The increased risk of mining in Nullsec is not equal to the reward. " There is a couple of ways that your comment could be interpreted. Personally I think that the risk is too low and the prices are deflated. However though, why isn't the price of Morphite low as well? One would assume that since it is ONLY available in null (discounting WH for the moment) that it would be over-farmed. Double-so because only T2 manufacture consumes it and not in any great quantity. Is this a skill-gap? Has the availability of Morphite increased with respect to duration of Eve as a game? I need to think more on this issue you raised.